Now that school's back in session, the reading homework has begun! 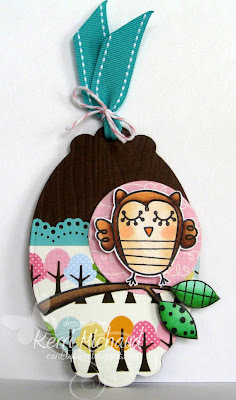 I pulled out this darling owl from the My Cute Stamps Set Little Forest Friends ~so perfect for a bookmark! I stamped the owl with Memento Tuxedo Black ink and colored him with Copics. I used a Nestabilities Labels 10 Die to cut out my bookmark along with some Echo Park Paper Co. Country Drive dp. The top of the bookmark was embossed with the PTI woodgrain impression plate and I added a pretty punched border with the Martha Stewart Doily Lace Border Punch. The branch that the owl is perched on is also from the My Cute Stamps Little Forest Friends Set and a little ribbon and baker's twine finished it off! 10% OFF EVERYDAY and CLEAR STAMP SETS SHIP FREE IN THE US!!! Thank you for stopping by and have a wonderful Thursday! Girl, this project knocks my socks off! You are the queen of bookmarks and I bow down before your awesomeness! i LOVE this! so darling & sure to bring a smile whenever it's used! Kerri you make the BEST bookmarks!! I bet your kids love to read!! :) I LOVE the shape of this and will have to keep that in mind the next time I do a bookmark. What a sweet and wonderful bookmark Kerri. I love the papers and the shape. AWWWWWW this is toooooo cute!!! Just adorable! I'll have to remember to make a tag bookmark...its so cute! !